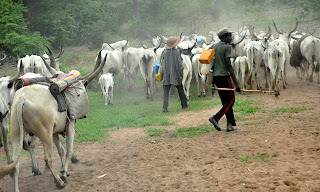 Following the threat issued by the leader of the Miyetti Allah Cattle Breeders Association, MACBAN that the Senate president, Dr. Bukola Saraki should resign or be forced out of office, the Peoples Democratic Party (PDP), has therefore given President Muhammadu Buhari a 24 hours ultimatum to arrest the leader. The party noted that if the president fails to order the arrest of MACBAN leaders and commence their prosecution, Nigerians will hold him responsible for the actions of the group, going forward. A statement by PDP’s spokesperson, Kola Ologbondiyan said the threat has allegedly exposed the alleged synergy between APC and MACBAN. The statement reads, “If anything, this unguarded statement by Miyetti Allah has exposed the synergy between the ruling party and some troublesome elements, who are being used to stoke division and create violent crisis that had resulted into daily bloodlettings in various parts of the country. “It is now abundantly clear to Nigerians that those fomenting crisis, including the bloody clashes in Benue, Taraba, Zamfara, Nassarawa, Plateau, Kaduna, Edo, Borno, Yobe, Enugu, Kogi, Adamawa and other states in our country, have political backers, who now want to channel them to achieve their unpatriotic quest to subvert our constitution and forcefully take over the National Assembly. “Before now, to majority of Nigerians, the Miyetti Allah has always represented the military wing of the APC and the Buhari Presidency. “It is incontrovertible that they have now become the fourth arm of government that can determine when and how to forcefully remove the number three citizen, the President of the Senate. “It is common knowledge that Mr. President has come under heavy public criticisms on how his body language has condoned the unguarded utterances and actions of these characters. “However, in the light of these treasonable and inciting utterances by Miyetti Allah, we demand that President Muhammadu Buhari, should within the next 24 hours, order the arrest and commence immediate trial of the leadership of this group, otherwise Nigerians will henceforth hold him directly responsible for the utterances and actions of the Miyetti Allah. “Finally, the PDP is aware that Miyetti Allah does not represent the views and interests of the vast majority of cattle breeders or even any ethnic group in the country.